This paper presents French historical sources and references about Tobago collected in the Libraries and Archives of Martinique and the record of two archaeological missions sent from Martinique to Tobago in the 1990’s. French contributions to the history of Tobago, published or not, gives light on the French speaking protestant Walloons who settled in the island during the 17th century. In addition the author shows the links between Dutch and French Huguenot families in the West Indies in spite of the French State. Cet article tente la recension des sources et de la bibliographie de l’histoire de Tobago en langue française dans les fonds des Archives et des Bibliothèques de la Martinique et rappelle les missions archéologiques martiniquaises envoyées dans cette île au cours des années 1990. Les travaux français éclairent le rôle joué au XVIIe siècle par les Wallons, protestants de langue française, dans la colonisation de Tobago. L’auteur montre ensuite les liens tissés aux Antilles entre les familles hollandaises et huguenotes, malgré les persécutions de l’Etat français. 1In August 1992, the Departmental Record Office of Martinique printed a catalogue of an exhibition hold in Tobago at the request of the French Embassy in Port of Spain1. The exhibition tried to show the numerous ties that had bound Tobago and the French West Indies, during the seventeenth and the eighteenth centuries. The lengthy correspondence of the French Administrators based in Martinique was the focus of this event but, today, evidences of the old and constant moves back and forth of simple men between Europe and the two islands deserve more attention. 2Dr Nardin considered a colonial history of Tobago in the seventeenth century was lacking2. In his view, the study should use the complete set of available and accessible sources; especially hardly known French archives and totally ignored Spanish ones. 3I intend with this paper to present some French sources and references hastily collected in the Libraries and Archives of Martinique3. If the harvest had been little things and may disappoint some readers, my concern remains to show the keen interest that some French scholars still take in the history of Trinidad and Tobago, and to express mine. Most of these documents, I am sure, are already known to the historians of the Caribbean, but I hope that some novelties will be found, especially among the papers published in Martinique and Guadeloupe by local Historical Societies. 4To these documentary publications I add the result of my personal investigations and references of some articles available in Martinique listed below. 5The third era of Tobago history starts in 1613 with the claims for settlement of the Dutch from Flushing, the English, the Courlanders (or Couronians) and the Swedish, even the French. This period lasted until the beginning of the eighteenth century when the island returned to a solitary silence. 7 MACAU, Jacques (1974), Projets suédois. 8 NARDIN, Jean-Claude (1969), La mise en valeur de l’île de Tabago. 6The history of the Dutch occupations of Tobago had been studied in English by Dr. Arie Boomert4, the seventeenth century Couronian settlements by Prof. Edgar Anderson5 in English and Prof. Hermann Kellenbenz in German6, while the Swedish attempts and French dominion during the eighteen-century are well known after the works in French of Dr Jacques Macau7 and Dr Jean-Claude Nardin8. The early French colonial attempts alone seem to escape historical investigation; thought early French settlers can be identified among the Dutch and Couronian immigrants. 9 SAINT-YVES, G. (1899), p. 224-234, 238-240. 7The oldest French paper related to the colonization of Tobago by France I had found is an Analysis of the campaign of Vice Admiral Comte D'Estree to recapture Cayenne and attack Suriname, Tobago and Curacao. It was issued at Paris in 1899 by a French scholar named Gerard Saint-Yves and contains an Account, based on archival material, of the failure to attack the Dutch fort in February-March 1677 and the success of its capture in December of the same year9. 10 NARDIN, Jean-Claude (1966), “Tabago, Antille française (1781-1793)”. 8In 1966, the Society for the History of Martinique dedicated the annual issue of its Annales des Antilles (number 14) to the history of Tobago. This study of a hundred pages by Dr Nardin is of great interest for the knowledge of the last attempt of France to hold the island at the turn of the nineteenth century. In fact, this paper is a duplicate of a chapter of the thesis Nardin published three years later10. 9In a following issue of the same Historical Society of Martinique bulletin (number 24) Prof. Debien and Dr. Châtillon give an original review of the books and tracts published in the seventeenth century to encourage French migrants to settle in the West Indian islands, among which we find Tobago praised by Reverend Charles de Rochefort's pamphlet. 10This attention given by French scholars to islands others than those under the dominion of France is rare enough to be noticed. In fact we know little about Charles de Rochefort, the first author of a Relation of the Island of Tobago and possible witness of the life of its first European settlers. If we consider that De Rochefort first book (Histoire naturelle et morale, 1658) already contains some details about Tobago and that we have nothing before the Poyntz's well known prospectus on Tobago settlement11, printed in 1683, we must agree with Debien and Châtillon about the usefulness of a study of his life and work and more widely of the early French presence in the seventeenth century. 13 ANTOINE Régis. 1978 Les écrivains français et les Antilles, Paris, Maisonneuve, p. 26, 33-35. 11Four years before De Rochefort, Dominican Father Jean-Baptiste Dutertre also provided us with information about Tobago in his Histoire Générale des Isles12. This leads Prof. Regis Antoine to investigate the documentation of both writers and the veracity of their accounts13. 12Coming back to my revue of French contributions to the history of Tobago, I make a special mention of the Department of Antiquities of Martinique, now called Regional Archaeological Service for its long last interest, fieldwork and publications. 13The Department of Antiquities of Martinique undertook to publish a revue named Caribena and achieved it during for years (1990-1994). After the second issue had been printed, a great Dutch historian of Tobago, namely Professor Arie Boomert, asked us to publish a very good paper untitled: "The oldest place Names of Tobago". Thought this study is, in a way, the extension of Nardin's one published by Caribbean Studies in 1962, it was never printed14. 14The Archaeological Office still holds a typewritten version in its files and I suggest that the University of the West Indies or some institution in Tobago asks Professor Boomert licence to publish his valuable contribution to the history of this island. 16Three major periods can be distinguished in the cultural history of Tobago. The first is Amerindian; the second is Spanish and started in 1502 when Alonso de Ogeda accompanied by Columbus’s pilot Juan de la Cosa, sighted the island and decided to Christianise it by the name of his ship La Magdalena15. Scholars from Paris and archaeologists from Martinique had contributed to the knowledge of the Amerindian and Spanish periods after two campaigns of investigation. The first excavations were conducted at Crown Point and Turtle Beach in 1992 on Amerindian sites16. The second was a salvage excavation of the "Cabildo" house, in the old Spanish quarter of downtown Port of Spain, by a team based in Martinique with the help of archaeologists of the University of the West Indies, in 199417. 17In summer 1990, while the fitting up of Scarborough harbour was carried on, a diver found a bronze cannon which appeared to be French cast and dated 1663. It is likely to belong to the armaments of some French vessel among those who where sunk down on 3rd march 1677, during a naval battle which opposed admiral d'Estree's fleet and a Dutch squadron. Naval archaeologists Max Guérou and Marc Guillaume, based in Martinique, were requested by the authorities of Trinidad and Tobago to conduct an expert evaluation of the area. They were expected to check over the potential sites and verify if the fitting out of the harbour had damaged any. A diving campaign had been completed to explore the area. The investigations result is that the works carried on had disturbed no archaeological site. The artefacts found during and after these works were of the same kind that those usually collected in mooring sites. The place where the French bronze cannon was found is outside the area affected by the fitting out of Scarborough harbour. Some French warship is likely to be still lying there18. 18Dr Nardin wrote that during the Devolution War (1667-1668), France took Tobago from the English who had just thrown the Dutch out, not remembering that French-speaking settlers were already there (Nardin, Tabago, 1966, p. 11). The first claim for settlement of the Dutch from Flushing was in 1613, but ended to nothing. There was an attempt from some English privateers to settle Tobago in 1625. 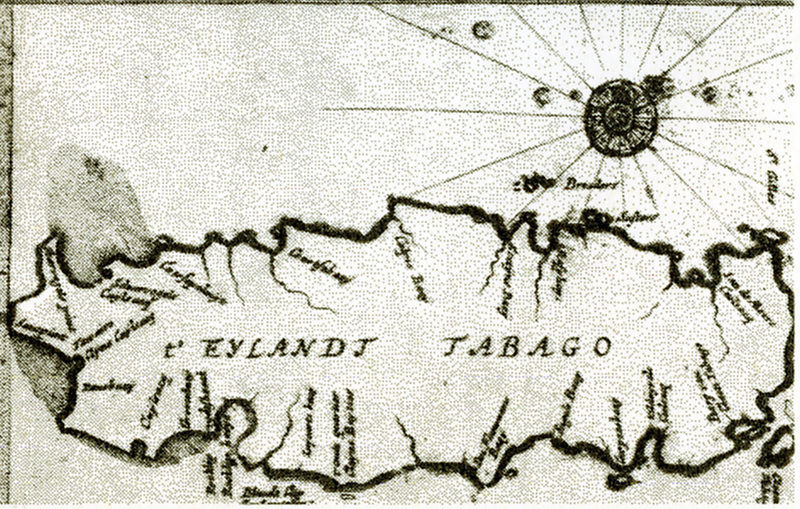 In 1626, Captain Robert Goddard called at Tobago for refreshment and, after his return to England, recommended the settlement of the Island to the Earl of Montgomery19. Some Calvinist Frenchmen were behind the English in this activity, for their urge to colonize was limited by catholic merchants circle in some ports and received governmental discouragement if not open restriction. In 1627, on his way home from Brazil, Captain Joachim Gijz of the WOC ship Kater visited Tobago and found it unoccupied by white people. On his arrival, he reported favourably on its suitability for the establishment of a colony. Then the first colony of the island was founded by Dutch privateers at present Great Courland Bay in 1628 and given the name of Nieuw Walcheren (after an island in Zeeland), which became Nieuw Vlissingen (New Flushing) in 1632. 19Behind the organised fleets of the Dutch West India Company, moreover, there still operated a swarm of private Dutch merchants, more or less tolerated interlopers in the company's official preserve, picking up cargoes wherever they could find them, often in places too insignificant to be worth the company's attention. At that time, French Huguenots of La Rochelle were behind the Dutch as well as behind the English, seeking for opportunities of trade and settlement. 20The first colonizing plan for Tobago had been set up by Jan de Moor, a wealthy and prominent merchant-adventurer, then the Burgomaster of Flushing and a member of the State Council of Holland. A Walloon community driven out Avesne sur Helpe (in nowadays Northern France) by Spanish persecution had taken refuge in Leyden under the guidance of Jesse (or Josse) De Forest; then Huguenots from everywhere in France followed them in Flushing. In 1623, De Forest asked De Moor a passage to America on one of his vessels, in order to settle fifty-four families on the Wilde Coast. De Moor agreed but separated them in three groups, one of them directed by De Forest to the river Oyapock (in present French Guyana)20. The little colony lasted one year until the death of its leader and rejoined the second group at Nieuw Avesne, later New Amsterdam and nowadays New York, under the command of the “Walloon” Pierre Minuit in 1626. Quite little is known of the third group fate but it may be alleged that it had been sent to Tobago along with new Huguenot refugees escaping religious persecutions in France. 21In March 1629, the settlement of Tobago was strengthened by fifty-six settlers from Flushing (Flessinguen) among whose could have been the first French speaking « Walloons » (actually an area covering Thierarche, Hainault and Brabant) from Spanish Low Countries present-day Northern France and Southern Belgium. This early presence of French speaking Calvinists among the Dutch colonist leads to reconsider the value of De Rochefort’s account. 22The first expedition organized by Duke Jacobus of Courland reached Tobago in 1639 with two hundred and twelve men who established themselves in a place near the Dutch site of Nieuw Walcheren. Before the end of the same year, the colony was reduced to nothing and the fate of the survivors is unknown. A second convoy fitted in Holland reached Tobago in 1642, but its remnants settled in Guyana in 1650. The English attempts between 1639 and 1642 ended with the same destiny. When the Duke of Courland obtained his concession on Tobago from the English in 1651, Dutch mixed with French speaking "Walloons" used to call at the island; in fact the Courlandian colonization began later, in 1654. 21 GOSLINGA (1971), The Dutch in the Caribbean, p. 442. 23Goslinga said that Dutch merchants hoping to avoid problems with the monopoly of the Dutch West India Company mainly financed the Courtland slave-trading company21. Prof. Kellenbenz, thinks that the duke himself was financed by Dutch merchants in his colonial enterprise. Otherwise, four Dutchmen put ashore before the arrival of the Courland ship in May 1654, were incorporated into the colony, as where Cornelius Caron’s Dutch survivors of a former Courtland expedition of 1642. 22 DEVEZE, Michel (1977), p. 150. 25Though an agreement had been signed between Duke Jacobus of Courland and King Charles II of Britain when De Rochefort paid a visit to Tobago, the Great Revolution reduced it to nothing. Otherwise, the Lampsins brothers had refused to treat with the Duke and considered Tobago as Dutch colony. In fact, the brothers Adriaen and Cornelis Lampsins, both merchants of Flushing, bought the island, at least part of it, to the Courlanders ; it is more probable that the Dutch gave money to the corrupt leaders of the Courlandian colony to settle in the Island. Indeed the Lampsins brothers felt better protected by France than by a petty Latvian prince against the English and so doing expected to avoid problems with the Dutch West Indies Company. In fact, since 1658, the island was occupied by Courlanders, Dutch and Walloons and since 1662, under the command of the Wallon Hughe de Beveron, appointed by the Lampsins not by the Dutch West India Company. 26De Rochefort first publication was the Histoire Naturelle et Morale des isles Antilles de l'Amérique, printed at Rotterdam in 1658; his Tableau de l'isle de Tabago was published at Leyden in 1665 only, with an anonymous Dutch map of the same year23. This means that De Rochefort was still living at that time and may be just arrived from the island24. 27We must throw out the biography given on line by Wikipedia Encyclopaedia; it makes De Rochefort a jurist born at Belley (France) in 1630 and dead in the same place in 1690 : this may be Cesar certainly not Charles De Rochefort. The notice accuses him to have edited under his name The Histoire and the Tableau actually written by Philippe Longvilliers de Poincy (1583-1660) and Father Raymond Breton (1609-1679) ? 28In 1987, Dr Boomert called De Rochefort "a Walloon clergyman who served the colony in 1664-1665", though it is sure he was not from Wallonia. It is also doubtful that he had stayed in Tobago at this date, as underlined by Prof Debien and Dr Châtillon in their analysis of the book published by De Rochefort at Leyden during the Dutch dominion. In a thesis examined in 1977, Professor Regis Antoine had given some details about the life of this Frenchman who came to the West Indies as a Protestant clergyman ; nevertheless, in 1981, Prof Debien and Dr Chatillon were still calling for a study of the life of De Rochefort and of the relations between his books and Dutertre's ones. We are still waiting for the completion of such a useful work in French, but, meanwhile, some steps were made forward by an English speaking scholar. 26 ANTOINE Regis (1977), p. 26-27. 29Prof. Philip Boucher considers De Rochefort as an appointed propagandist of the French General Governor De Poincy posted in St Kitts (1638-1660). It must be pointed out that Prof Boucher, not a Frenchman in spite of his French name, is certainly the best informed historian about manuscript and printed sources in France for the early colonial period25. But neither Prof Boucher nor Dr Boomert did trace French sources in Holland where information about De Rochefort can be found. Prof Antoine reported that the Gementarchief in Rotterdam preserves the "Actes des Synodes des Eglises Wallonnes", written in French, which contains manuscript notes of Charles de Rochefort about himself, the Antilles and their protestant settlers26. 30According to Prof. Antoine's assessment, De Rochefort had been delegated by the Calvinist community of La Rochelle, in France, to take care of the French speaking protestant settlers scattered in the Caribbean. His first stay was in La Tortuga island, offshore present Haiti, where he acted as assistant minister or chaplain for the French Protestant Governor Le Vasseur installed there with a commission of Governor General De Poincy dated 1640. He moved to Dutch Saint-Eustachus as minister and, maybe, afterward to Tobago then ruled by the Dutch Lampsins brothers. Back to Europe in 1650, De Rochefort stayed in Flushing and later in Rotterdam. The date and place of his death are not known. 31Prof Debien and Dr Châtillon think that, once back to Holland, in 1650, De Rochefort used a relation made by the actual French Protestant Minister in Tobago, Reverend Du Chillou, and copied out documents borrowed to him by the Lampsins brothers. Both of these Dutch merchants had been created baronnets of Tobago by French King Louis the 14th. Debien, Chatillon and Boucher are sure that De Rochefort was stipendiary of the Lampsins for his writings and that they paid for the printing. 27 Quoted by ARCHIBALD Douglas (1987), Tobago: 42-43. 28 Journal of A. de Westuysen, April 27th 1667. Quoted by ARCHIBALD Douglas (1987), Tobago, p.31-32. 32De Rochefort’s writing and the Gementarchief files in Rotterdam give evidences that, in 1660, there was a French speaking protestant community in Tobago : Reverend Du Chillou had the ministry of that flock when, some say, De Rochefort paid a visit to the island in 1664-1665. In fact, the descriptions he gave reflect the success of the Lampsins plantation between 1658 and 1665, and sounds similar to the anonymous Memorial of 1667 prepared for the governing bodies of the United Provinces of Holland27 In 1667, a Dutch navy officer under the command of Abraham Crynnsen who visited the island had the same praise to offer, thought not a stipendiary of the Lampsins28. 33No matter when he went, De Rochefort is by himself a proof of the Walloon presence in Tobago and the link between the French Huguenots and the Dutch merchants. The key role of both maritime republics of La Rochelle and Flushing is also ascertained by the names of the expedition ships, the Tobagonian toponymy.and genealogical occurrences. 34It is said that the English drove the Dutch out in 1666, but the treaty of Breda, which ended the Second Dutch War in 1667 and the treaty of Aix-la-Chapelle which ended the Devolution War in 1668, laid down a territorial division in the Eastern Caribbean: the French received Tobago then returned it to the Dutch. In the meantime, part of the « Walloons » settlers, if not the whole, might have stayed on their spots. 35In the four years that followed Duke Jacobus’ first colonial expedition seven ships were sent out from Europe, quite all fitted in Flushing. As many as two thousand men, women and children went to Tobago, while each ship returned with a cargo of pepper, sugar, ginger and tobacco. Examining the name of the Courland ships which have been preserved on files is relevant to find the Walloon presence onboard. Among seven ships five have French names : Constance, La Paix, La Dame, Le Cavalier, Le Roi David ; one captain is without doubt Walloon : Nicolas de Brieux. 29 BOOMERT Arie (1994), The oldest place names, p. 4. 36Study of Tobago place names shows that, not counting duplicate names, in all 38 present toponyms dated back to the period before the 1763 cession of the island to Britain. Among theses early names 13 are of Dutch origin and 12 of French one. Although Dr. Boomert thinks that the French derivated toponyms date back to the early-eighteenth century and, besides, may be gallicized originally Dutch names of the early period, because “only the Dutch and Courlanders were able to establish themselves on a more or less permanent basis29”. In fact their etymology reverses this allegation. The present Tobagonian toponyms can also be divided into descriptive, biblical, honorific, commemorative and fanciful names. If the three latter groups reflect Tobago historical experience (e. g. Frenchman’s River), the two former categories may be characteristic of the first French colonial wave echoing similar place names of the same time in Canada, the West Indies and even the Mascarenes. Such are : Parlatuvier Bay (originally Paletuvier Bay, i.e. Mangrove bay), Trois Rivieres, Anse30 Batteau, Anse Brisant, Anse Fourmi, Anse Fromager and especially Anse Goulème. This latter name represents a corruption of Anse d’Angoulême, Angoulême being a French town known for his Protestant Academy in the first half of the seventeenth century. Crown Point could be the corruption of Caron Point, the seventeenth century name of a cape called after “Walloon” Captain Caron who led a colony from Flushing under Curlander flag from 1642 to 1650 as recorded by De Rochefort. 37Petit Trou replaced in the early eighteenth century the original name Cuijlsacq (1665), Dutch corruption of the seventeenth century French Cul-de-sac (a profound bay). 38Dutch and English cartography are certainly responsible for majoring the survival of place names in their languages. However, the majority of surviving seventeenth-century toponyms had been transmitted by the small population of French speaking settlers who inhabited Tobago from the 1630 to 1763, notwithstanding the claims and attempts of the French kingdom nor those of other European States : French speaking does not mean French subject or civilian. 31 CAOM, F 3 64, f. 29. Quoted by BRUNEAU-LATOUCHE and RIFFAUD (1992), p. 11 note 2. 40"Il faut avouer à l'honneur des Zélandais qui étoient à Tabago qu'ils montrèrent une diligence et un zèle extrême ; dans l'espace de peu d'années ils la rendirent une des plus belles et des plus florissantes colonies des Indes Occidentales31". 41For this period, the short introduction of Nardin's Tabago is very inaccurate, but his opinion on the French Kingdom attitude is worth debating. According to him, the victory of Admiral d'Estree in 1677 (sic) became a conquest ratified by the treaty of Nimegue (1678). But the conquerors contented themselves with havoc of fields, farms and warehouses : no effective possession was taken, probably because of the vigilant envy of the Martiniquese colonists (Nardin, 1966, p. 11). What Nardin could not imagine is that all around the Caribbean Basin, French speaking settlers, whether French subjects or not, had been in permanent contact until the beginning of the eighteenth century, inside and out the French dominions. 42I knew my ancestors was Dutch and came from Flushing (Flessinguen) but I though they had been Martiniquese settlers till the beginning of their arriving in the Caribbean. While looking for the history of one "habitation" in southern Martinique, I came to a genealogical booklet and red that my first West Indian ancestor, Jan Huyghe, was "habitant in the island of Tabacq in the Antilles and died there before 1679". His two sons were born in Tobago in 1670 and 1671. 43At the beginning of June 1654, a flock of Dutch refugees from Brazil on the ship of captain Beck called at Tobago, a few weeks after the Courlanders had arrived. Their ship had lost a rudder and the repair took a few weeks. After six weeks the Dutch were brought to Europe on a Courlandian ship (Anderson, 1956, p. 113). May be some of these refugees found the island hospitable and planned to come again and stay. Among them could have been Jan Huyghe. Indeed the two genealogists who wrote about the Huyghues family say that Jan Huyghe was not necessary born in Holland. He could be born in Brazil (to the Dutch between 1630 and 1654). Married in 1668 (we do not know where), he should be born before 1645. 32 CAOM, C 10, E 296, Dossier Mahault. Quoted by BRUNEAU-LATOUCHE et RIFFAUD (1992), p. 209-211. 44Which is sure, after a testimony drawn up by a notary, is that Jan Huyghe, a Dutch colonist, lost all his properties in the attack and if not already dead in Tobago sailed to La Rochelle, in France, with his family32. 33 CAOM, F 3 64, f. 29. Quoted by BRUNEAU-LATOUCHE et RIFFAUD (1992), p. 11 note 3. 46"En 1673 nous eusmes soins de prendre notre revanche. Ce fut dans ce dessein que Tobie Bridges ayant pris sur ses vaisseaux un régiment de la Barbade alla faire une descente à Tabago. Il y fit quatre cents prisonniers et y enleva un grand nombre de nègres33". 34 ADELAIDE-MERLANDE, J. (1993), “Trinidad et Tobago”, p. 2277. 35 ARCHIBALD Douglas (1987), Tobago, p. 44. 47Adelaide Merlande writes that the English attack took place in 1672, without quoting reference34. In fact, war broke between Britain and Holland in March 1672 ; as a result Colonel Clive Codrington, acting Governor of Barbados considered attacking Tobago but desisted when he learned about Dutch defence. However, in December of the same year Lord Willoughby decided the attack and despatched a fleet of seven small transports with six hundred soldiers, under the protection of H.M.S. David commanded by Captain William Poole. Sir Tobias Bridges was placed in command of the overall expedition35. No doubt this Tobias Bridges is the Tobie Bridge of the account preserved by Moreau de Saint-Mery. The expedition reached Tobago on 16th December and proceeded to land the troops on the morning of the 18th to far to be efficient. In fact the British never gained victory but on 21st December received the surrendering of Pieter Constant, Dutch commandant of the Fort, who freely sailed to Curacao on a small barque with his family and all the leading officers and citizens. Ten French settlers who had surrendered gained their freedom by joining the British party. It is likely that Jan Huyghe and family were among the favoured ones who sailed to Curacao and then to Amsterdam or Flushing. 48Britain ended war in May 1674 and the same year the Dutch occupied again Tobago and rebuilt Lampsiusburg and the Fort. In 1676, the Duke of Courland sent the ship le Geant from Amsterdam with new settlers. The Huyghe were not among them. 49On April 10th of 1679, at La Rochelle, Marguerite Doens born in Flushing and the widow of Huyghe married Jacques Mahault, a French resident merchant of this town36. 37 PETITJEAN ROGET et BRUNEAU-LATOUCHE (2000), 1, p. 541; 2, p. 307/36. 50Mahault, his new wife and her two sons Huyghe were present at Saint-Pierre Le Mouillage, Martinique, in 167937. They are my direct ancestors from both sides, maternal and paternal: the elder son stayed in Martinique, while the younger went back to Tobago and later to Cayenne (1686). 51This story gives proof of the sturdy links between La Rochelle and Flushing before the Revocation of the Nantes Edit (1685), of the mobility the French Huguenots and their Dutch allies experienced overseas and above all shows how persecuted minorities could evade State oppression and boundaries to find places to stay safely in the Caribbean Islands. 52Plate : Anonymous map of 1665, probably drawn by Willem Mogge and printed to accompany Rochefort’s description. It was reprinted as part of an engraving by Romeyn de Hooghe, showing the attack in 1677. Excerpt of this engraving. Probably drawn by Willem Mogge and printed to accompany Rochefort’s description. It was reprinted as part of an engraving by Romeyn de Hooghe, showing the attack in 1677. Excerpt of this engraving. ARCHIBALD Douglas. 1987. Tobago « Melancoly Isle », volume one 1498-1771, Port-of-Spain, Westindiana Ltd.
GIACOTTINO Jean-Claude. 1976. "Trinidad et Tabago", Bulletin d'information du CENADOM, n° 31, mai-juin 1976, p. 5-15. ADELAIDE-MERLANDE Jacques. 1993. "Trinidad et Tobago", dans CORZANI, Jack. 1993. Dictionnaire encyclopédique, Fort-de-France, Editions Désormeaux, 7, p. 2275-2279. BAUDRIT André. 1967. Charles de Courbon Comte de Blénac (1622-1696). Gouverneur Général des Antilles Françaises (1677-1696), Fort-de-France, Mémoires de la Société d'Histoire de la Martinique n° 2, 1967. Very little occurrences of Tobago. BRUNEAU-LAROUCHE, Eugène et RIFFAUD Maud. 1992. Essai sur les Huyghues. Une famille créole de la Martinique du XVIIe s. à 1870, Paris, Centre de Généalogie et d'Histoire des Isles d'Amérique. Contains a copie of part of a map of Tobago dated 1776, BNF, Ge C 16389 Reproduction of the complete map in Nardin's Tabago (1966). CHATILLON Dr Marcel et DEBIEN Gabriel. 1981. "La propagande imprimée pour les Antilles et la Guyane au XVIIe siècle, recrutement ou racolage ? ", Annales des Antilles, n° 24, 1981, p. 57-98. p. 84-88 : Vers Tobago avec le ministre Rochefort. Analysis of the book published during the Dutch dominion by Rochefort. DEVEZE Michel. 1977. Antilles, Guyanes, la mer des Caraïbes de 1492 à 1789, Paris, SEDES, 1977. A couple of lines on Tobago. MACAU Jacques. 1974. Projets suédois de colonisation outre-mer au dix-huitième siècle, Chez l’auteur, Grindvägen 20 b, Suède – 76100 Norrtälje, 1974, 2 fascicules multigraphiés. NARDIN Jean-Claude. 1962. "Sur le nom de l'île de Tobago”, Caribbean Studies, 2 (2), 1962, p. 31-34. Quoted by Boomert in his "Place names". NARDIN Jean-Claude 1966. "Tabago, Antille française (1781-1793)", Annales des Antilles, 1966, n° 14, p. 7-104. NARDIN Jean-Claude. 1969. La mise en valeur de l’île de Tabago, 1763-1783, Paris, EHESS. PETITJEAN ROGET Jacques et BRUNEAU-LATOUCHE Eugène. 2000. Personnes et familles à la Martinique au XVIIe siècle, d'après les recensements et terrier nominatifs, Fort-de-France, Editions Désormeaux, T. 1 Documents, t. 2 Dictionnaire. RENNARD Joseph. 1935. Baas, Blénac ou les Antilles françaises au XVIIe siècle, Fort-de-France, Alexandre et Thonon, Le Messsager. VILLACEQUE Georges. 1967. "Trinidad et la Révolution françaises", Bulletin de la Société d'Histoire de la Guadeloupe, n° 8, 2ème semestre 1967, p. 60-78. SAINT-YVES Gérard. 1899. "Les campagnes de Jean d'Estrées dans la mer des Antilles (1676-1678)”, Bulletin de Géographie historique et descriptive, p. 217-248. Récit de l'attaque infructueuse du fort sur les Hollandais en février-mars 1677 et de sa prise en décembre de la même année, p. 224-234, 238-240. ROCHEFORT Charles de. 1665. Le tableau de l'Isle de Tobaggo, ou de la Nouvelle Oüalchre, L'une des isles Antilles de l'Amérique, Leyde, 1665, Paris, 1667, avec enrichissements du pasteur Du Chillou. BONNEVAL Comte de. 1955. "Mémoires de Pierre-Claude marquis Duquesne", Annales des Antilles, n° 3-4, 1955, p. 129-143. Report of the evacuation of the Martinique emigrates to Trinidad. Complementary of the article of BESSON, Gerard (1992), "The French Creoles of Trinidad", in BESSON Gerard and BRETON Bridget 1992. The Book of Trinidad, Newtown Port of Spain, Paria Publishing Cy Ltd, p. 52-63. Tabago, série C 10 E 1, correspondance générale 1645-1783. Especially E 296, dossier Mahault which contains notarial copies from La Rochelle and other places concerning the Huyghues family. F 3 23 Memoir on Tobago among a collection of documents on West Indian Islands. F 3 64, Historique. F 3 64, f. 29 quoted by Bruneau-Latouche and Riffaud as an English document translated in French by Moreau de Saint-Méry himself. Anonyme, A Summary account of the present flourishing state of the Island of Tobago, with a plan of the island, London, S. Hooper, 1777, 30 p. Contains an alphabetical list of the land owners. DFC, section Tobago, dispatched among “Antilles étrangères” (7 pieces), memories, maps and charts. B 21, 3 février 1700 note sur la cession de la moitié de l'île par le duc de Courlande à une compagnie de Londres composée d'Anglais et de Français religionnaires. Vol. 9 (1620-1624) A variety of documents on the Dutch West India Company. 1 CHAULEAU Liliane. 1992. Tobago et la présence française XVI°-XIX° siècle : exposition orghanisée par les Archives Départementales de la Martinique, CARIFESTA V, Trinidad and Tobago 22-28 août 1992, Fort-de-France, Conseil général de la Martinique. The documents listed in the catalogue had been microfilmed in France and copies of them can be despatched by the Record Office of Martinique at request. 2 Four lines with errors about Trinidad and Tobago in DEVEZE Michel. 1977. Antilles, Guyanes, la mer des Caraïbes, p. 150. 3 Review of French material available in 1950 by BRUNSCHWIG Henri. 1957. L’expansion allemande outre-mer du XVe siècle à nos jours, Paris, PUF. 4 BOOMERT Arie., ORTIZ-TRONCOSO O. R., REGTEREN ALTENA H. H. van. 1987. “Archaeological-historical survey of Tobago, West Indies”, Journal de la Société des Américanistes (Paris), 73, 1987, p. 246-258. 5 ANDERSON, Edgar. 1961. The Couronians and the West Indies, Chicago ; 1961. “Die ersten kurländischen Expeditionen nach Westindien im 17. Jahrhundert in Baltische Hefte, (Hanover), band 8, 1, 1, p. 13-35; 1961. Die kurländische Kolonie Tobago”, in Baltische Hefte, band 8, 3, p. 216-232. 6 KELLENBENZ Hermann. 1970. “Von den Karibischen Inseln, III. Teil”, in Jahrbuch für Geschichte von Staat, Wirtschaft und Gesellschaft Lateinamerikas, Band 7, Köln/Wien. 11 POYNTZ Captain John. 1683. The Present Prospect of the Famous and Fertile Island of Tobago, London, 1683, London, 1695. 12 DUTERTRE Jean-Baptiste. 1654. Histoire Générale des Isles de Saint-Christophe, de la Guadeloupe, de la Martinique et autres dans l’Amérique, Paris, J. et E. Langlois. 14 BOOMERT Arie. 1994. “The oldest Place Names of Tobago”, Havikweg 24, 1826 JV Alkmaar, The Nederlands, 45 p., typewritten. 15 Although it is commonly held that Colombus first sighted the Island during his third voyage in 1498, recent thinking, after S. E. Morrison’s studies, shows this is a legend. La Magdalena did not survive as a name ; instead the island became known as Tavaco, Tabagua, then as Tabago. 16 KAMENEFF Leonid et MERLIN Jonathan. 1994. “Archaeological research in Crown Point, Tobago”, Caribena 4, p. 109-136. 17 French archaeological mission in Trinidad and Tobago, Fort-de-France, SRA, 1994. The report of this work is not for public diffusion but can be consulted at the library of the Regional Archaeological Office of Martinique, Fort-de-France. 18 GUÉROUT Max et GUILLAUME Marc. 1992. “Prospections sous-marines à Tobago sur le site de la bataille hollandaise du 3 mars 1677”, Caribena (Martinique) n° 2, 1992, p. 183-199. 19 Some historians still state that the British flag was the first to be hoisted in Tobago that year, if not in 1616 by a handful of Barbadian colonists, and even more in 1580 by Raleigh ! 20 See GUERITAULT Philippe. 1990. “Les Huguenots de la fin du XVIe à la moitié du XVIIe siècle”, in HUYGHUES-BELROSE Vincent (dir.). 1990. Histoire de la Guyane, Sanoli, La Grande Encyclopédie de la Caraïbe, vol. 7, p. 16. 23 BOOMERT (1994), p. 5, says that this anonymous map was probably drawn by Willem Mogge, the official surveyor of the colony, and printed to accompany Rochefort’s description. It was reprinted as part of an engraving by Romeyn de Hooghe showing the attack in 1677. 24 There is no known copy of this book in the French West Indies; the two editions usually quoted are in the BNF in Paris. I have been using a positive microfilm of the Leyden edition of 1665 provided by the Universiteit Leiden. 25 BOUCHER Philip P. 1985. The shaping of the French Colonial Empire. A Bio-Bibliography of the Careers of Richelieu, Fouquet, and Colbert, New-York and London, Garland Publishing Inc. BOUCHER Philip P. 1992. Cannibal Encounters. Europeans and Island Caribs, 1492-1763, Baltimore and London, The Johns Hopkins University Press. 30 BOOMERT Arie (1994), recognizes (p. 16) that the use of the noun anse (small bay) is typical of all the former French territories in the West Indies, but believes that it is suggestive of the early eighteenth-century French influence in Tobago, which is erroneous.